Tune into Radio Carly: Ichthyosis just got glamorous. Bling on trend for dry skin pt 2. Ichthyosis just got glamorous. Bling on trend for dry skin pt 2. Remember how I blogged about longing for a blinged jar of Vaseline? Well I asked and I received! 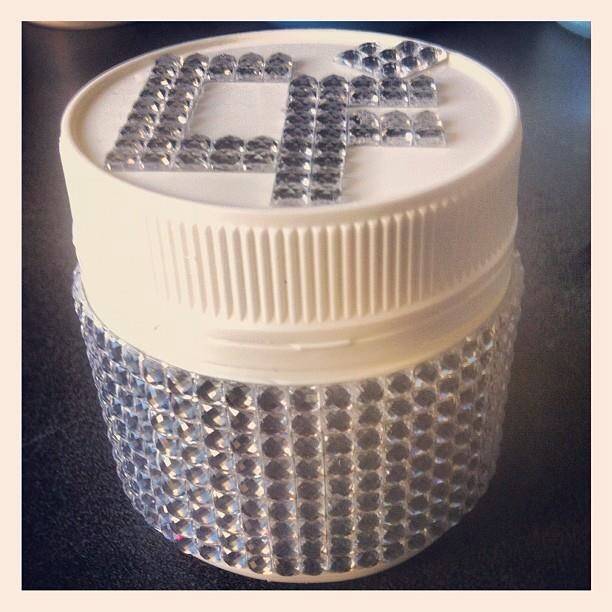 Chris blinged up a jar of Dermeze (paraffin blend) for my birthday! Isn't this the coolest?! I won't be using it, it will be on display. Shiny! I say use it, then use the cleaned out empty container to hold new, slightly smaller jars of Dermeze.